A twist on the usual, this tangerine marmalade recipe is made without the peel, so it’s less bitter than standard marmalade. You might even call it tangerine jam. Without the bitter peels, this becomes a much smoother spread. Let me be honest: I’m not a fan of marmalade. Those little bitter bits of peel? Very off-putting to me. Yeah, ick. I decided to modify the orange marmalade recipe from Pomona Pectin just a bit to see if I could come up with a less bitter citrus spread. Since our tangerine tree is loaded every year with a crop that we can’t eat fresh fast enough, I wanted a way to preserve some of that citrusy flavor. Of course there’s my salted citrus, but I wanted something a bit sweet in the pantry, too. I peeled the fruit before chopping it up, and of course used tangerines instead of oranges since that’s what I had an abundance of. Where the Pomona recipe called for water, I used tangerine juice for more flavor, and I added a bit of ginger and vanilla. It’s like a tangerine marmalade recipe, but without the peels. 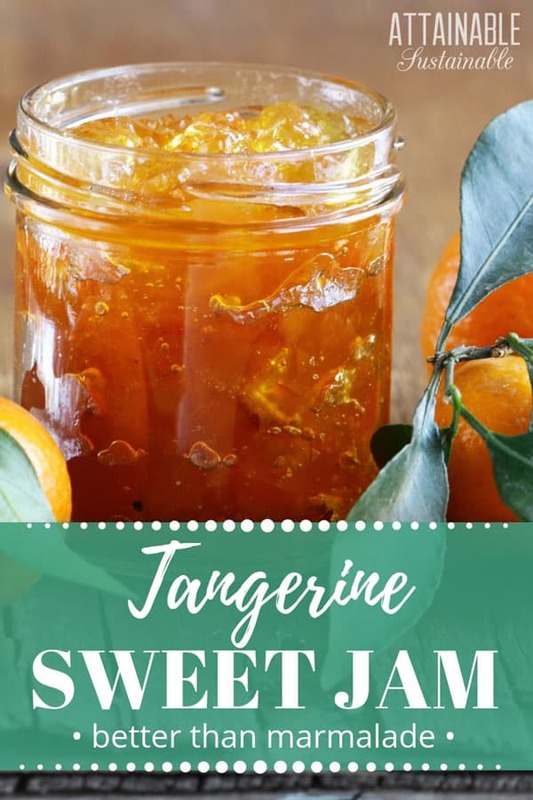 Maybe we should call it tangerine jam. The final analysis: I like it. The vanilla really helps to cut the residual bitterness of the tangerines. It will be good with butter on toast, but also as a pantry staple for baking or to flavor chicken dishes. ★ Did you make this tangerine marmalade recipe? Don’t forget to give it a star rating below! Less bitter than marmalade made with the peels, this version without the peels is a bit like a tangerine jam. Prepare the calcium water from the Pomona package. 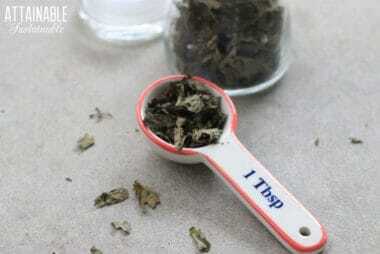 Put 1/2 teaspoon calcium powder (the small packet) and 1/2 cup water in a small jar with a lid. Set aside. Shake well before using. Fill your water bath canner to a level that will cover your jars. This varies depending upon jar size. Heat water to boiling, while proceeding with next steps. Finely chop the tangerines. I cheated and used a food processor. Much faster, if you have one. Put chopped tangerines, tangerine, juice, ginger juice, and 2 tablespoons of the calcium water into a large stock pot. Measure 6 cups sugar into a separate bowl. Thoroughly (and I mean thoroughly) mix in 3 tablespoons of pectin (the large packet from Pomona). Bring tangerines and juice to a boil, stirring frequently. Add sugar mixture and stir vigorously for a couple of minutes to dissolve the pectin. Return to a boil and then remove from heat. Fill jars to within 1/4″ of top. Wipe rims clean with a damp cloth. Screw on 2-piece lids/rings and place in boiling water bath. Bring water back to a boil (it doesn’t need to be a hard boil) and set the timer for 10 minutes. Remove jars to a towel-covered counter top to cool. Check seals. 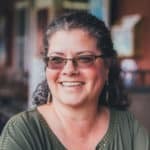 Lids should be solid and pulled down tight. (if they flex and pop, the jar didn’t seal; put unsealed jars in the refrigerator and use those first). Like the flavor pairing, says this jam girl. Anything I need to know (or special) about Pomona pectin? This sounds marvelous. I enjoy you having all those tangerines in your neighbor’s yard! 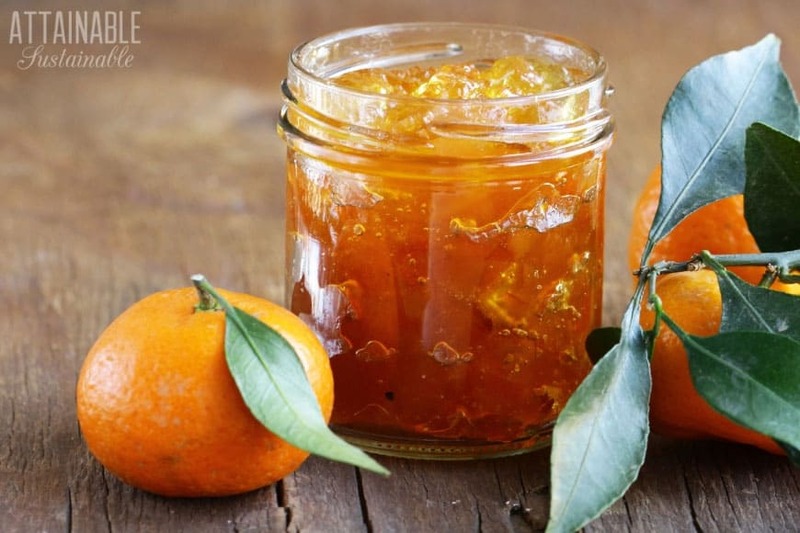 Love tangerines – creative way to work them into a jam. 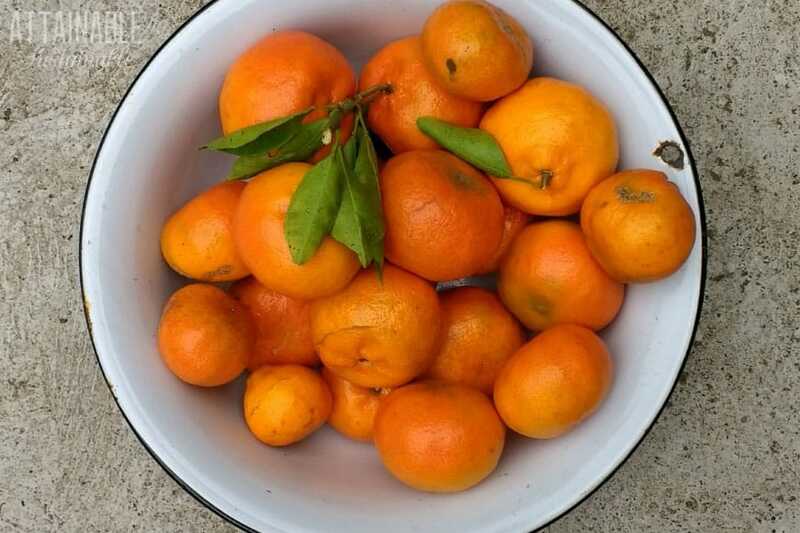 How nice to have your pick of tree-fresh tangerines. Love them, and I’m sure the jam tastes yummy. This looks awesome. I’ve made marmalade from scratch, and it’s NOT easy. I like the idea of the ginger in there too. Have you thought of using almond extract instead of vanilla? You wouldn’t use as much, but it might tone down the bitterness too. Even though I love most citrusy things, I too hate marmalade – and it’s because of the pith, just like it is for you. Glad to know I’m not alone! I love anything citrusy, including marmalade. And adding ginger would be a real plus for me. Had anyone actually tried this ?? 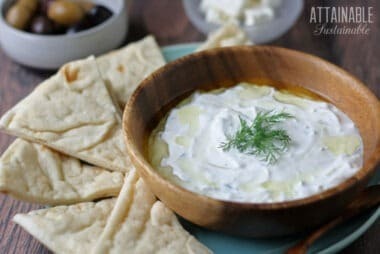 Easy to make and yummy too.